More and more I find myself dissecting the nutrition facts on the back of foods before I purchase them. I’m becoming that person; however, it’s sort of a necessity because ensuring that I get enough protein in my diet is a daily struggle. This is on top of the fact that there’s often hidden sugars and other ingredients that manufacturers slip into their foods unbeknownst to the customer thereby turning a seemingly healthy food into a hazard. So what do you do when you read something on the label that you don’t want to? True story: The grocery store up the street had a 4-pack of Chobani yogurt on sale for $2.99! Yes…..that’s not a typo. Because there are few things that make me happier than a good sale, I ran to the dairy aisle because usually a single cup costs about $1.53 (and I also just spend time taking in the free A/C). While I surely have vegan aspirations, buying yogurt is a relatively easy and quick way that to get protein in, so when it’s on sale, I definitely try to stock up. 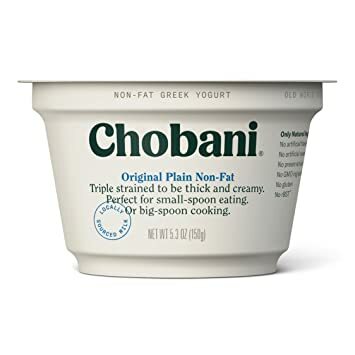 When it came time to decide which flavors to buy, I’m not sure why I thought Chobani would be any different, but all of the fruit in the bottom varieties had anywhere between 13 and 15 grams of sugar per serving whereas the plain unflavored only had 4. Good for my body but bad for my taste buds. According to a Business Insider article, there are other major yogurt brands that have almost double of what Chobani has. La Yogurt (original, lowfat, cheescake flavor) and Brown Cow (chocolate flavor) for example both have 28 grams of sugar, which is almost like eating a Double Chocolate Brownie from Starbucks just to put things in perspective. Essentially, most yogurts should be classified as a desert. I reluctantly bought two pack of plain greek yogurt knowing that it just wasn’t going to taste good. So now I’m stuck with all of this yogurt that I know is better for me but that I’m actually not all that excited about eating. I find plain greek yogurt to be bitter and pretty unappetizing. Was it worth it? Do I really have the time, energy and interest to try to make my yogurt appetizing? So far, I just add any combination of cinnamon, honey and or raisins to try to sweeten things up a bit, but I honestly feel like it’s just extra work. Why can’t yogurt be tasty and healthy? Am I asking for too much here? Other instances where good choices go bland are mostly when I skip on the condiments. BBQ sauce is another favorite of mine, but it’s loaded with sugar. I love the idea of butter with everything, oatmeal, eggs, toast, etc, but I usually refrain because I simply know better. The challenge here then is to find alternatives that satisfy my tastebuds but aren’t self defeating. So for now, I’m using raisins, honey (trying not to o.d.) and cinnamon to improve the taste. I can also incorporate it into my smoothies, and overnight oats which is ideal for plan yogurt rather than flavored. It’s honestly, not so bad; it just takes a little effort. Have you recently made a decision to go bland? How’s it going for you? Any life hacks to make bland taste better?